Local 100 President Tony Utano, Vice President Joe Costales and Train Operator Dedra Brinson visited Brother Leon George at his hospital bed at Interfaith Hospital just hours after the beloved Train Operator suffered a devastating stroke. They sadly report that Brother George’s condition is grave, with little hope of recovery. Utano has assigned Train Operator Brinson to assist the family, including George’s brother, a retired Train Operator, in their hour of need. 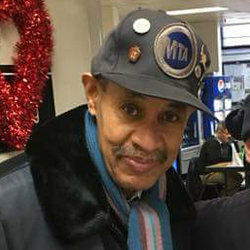 Brother George, # 1 on the Train Operator’s Seniority roster, is respected and admired throughout the Division. We offer our prayers for him and his family and friends during these most difficult hours.